Four Americans were among 15 people killed today in a suicide bombing in northern Syria that was claimed by ISIS, as the New York Times’s Eric Schmitt and Ben Hubbard report. Dive Deeper: “The Evolution of the Salafi-Jihadist Threat: Current and Future Challenges from the Islamic State, Al-Qaeda, and Other Groups,” by CSIS’s Seth Jones. Theresa May on Wednesday night narrowly saw off a vote of no confidence, but immediately faced a new confrontation with Labour leader Jeremy Corbyn as she tried to save her Brexit deal, as the FT’s Laura Hughes and George Parker report. Dive Deeper: “May Survives Confidence Vote, But Now Must Deliver a New Brexit Plan,” by the Atlantic Council’s David Wemer. The United States today rejected a Russian offer to save the Intermediate-range Nuclear Forces Treaty (INF) treaty that keeps nuclear missiles out of Europe because it could not be properly verified, setting the stage for Washington to withdraw from the pact next month, as Reuters’ Robin Emmott reports. Do you have any questions about trade and how a changing U.S. trade policy may affect your life? If you do, please email me your question(s) to aschwartz@csis.org. We’ll publish some of the best questions and get our experts to answer them on an upcoming CSIS podcast. Now enrolling for CSIS Crash Course, a one-day seminar on the fundamentals of U.S. international trade policy and politics for trade professionals. This program will be conducted by CSIS experts Scott Miller and Bill Reinsch, known as the Trade Guys from their highly-rated weekly podcast. Information here. China's central bank injected a record $83 billion into the country's financial system on Wednesday, seeking to avoid a cash crunch that would put further pressure on the weakening economy. As the 20th anniversary of Hugo Chávez’s rise to power approaches, Venezuela is suffering from a prolonged economic depression which rivals the magnitude of the Great Depression in the United States. 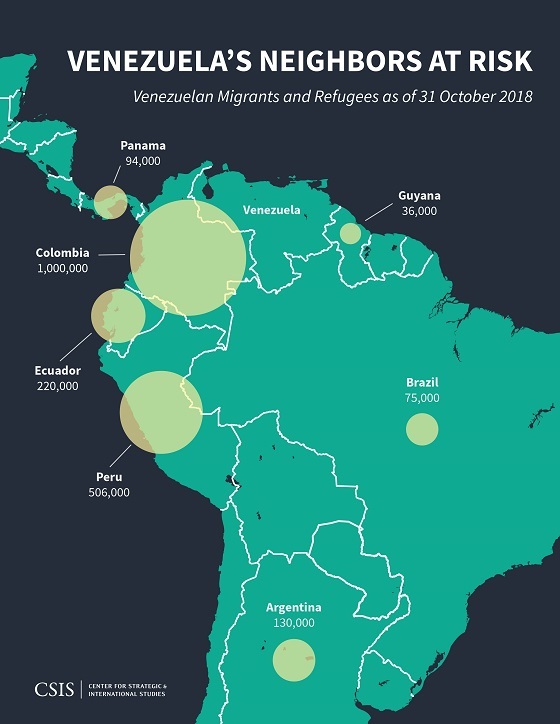 To learn more about how this domestic crisis has evolved into a regional humanitarian crisis, read a new commentary from the CSIS Americas Program here. (Photo credit: Jack Taylor/Getty Images). 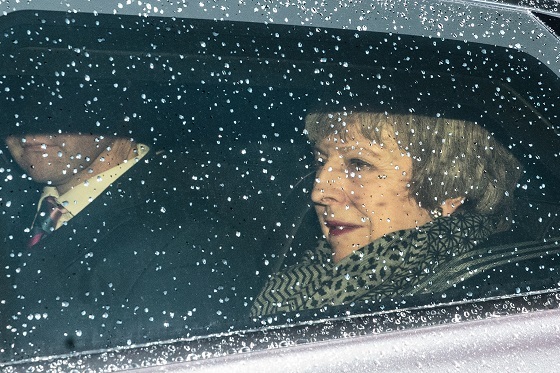 British Prime Minister Theresa May leaves Downing Street to face a second vote of no confidence in the House of Commons after her latest Brexit deal was rejected by a vote of 432 to 202. “As the 2020 race gets started, so too do key foreign policy debates,” by Brookings’s Ryan Trapani. At 10:30 a.m., join CSIS for a discussion with leaders from Standard & Poor’s and Moody’s to explore factors that could impact India's economic development leading up to its national election this spring. And at 10:00 a.m., Brookings will host a panel of leading Africa experts to offer insights on regional trends, along with recommendations for national governments, regional organizations, multilateral institutions, and civil society actors. Later, at 3:00 p.m., the Wilson Center, in partnership with the Daniel Morgan Graduate School of National Security, will hold a discussion on kleptocracy in Central Asia and its impacts on U.S. national security. CSIS today hosted a discussion on Japan's national defense strategy with Defense Minister Takeshi Iwaya of Japan. Watch the full event here. Energy 360° examines the energy landscape from the intersection of policy, markets, technologies, and geopolitics. With commentary from leading energy and CSIS experts, the podcast provides context and perspective on the most critical issues shaping energy today. Listen on SoundCloud or Apple Podcasts.